What is a brake fluid? A brake fluid is one type of hydraulic fluid used to apply in motorcycles, automobiles, light trucks and even bicycles. You may apply it on hydraulic brakes or in hydraulic clutches. This is widely used when you want to transfer force into pressure and when you want to amplify braking force. By the word itself, brake fluids are of course, liquid. You may ask, is liquid applicable in transferring force into pressure as well as amplifying braking force? The answer is yes. Because liquid is not compressible. In the natural state of liquid, the component molecules do not have internal voids and the molecules pack together well. That’s why bulk forces are transferred directly to compress the fluid’s chemical bonds. There are many types of brake fluids you can see on markets today. There are glycol-ether based brake fluids. There are also mineral oil based brake fluids. Make sure that the brake fluids you will buy are approved by the SAE, or local government equivalents. Brake fluids must be able to meet the certain requirements as defined by the various standards they set. Just take note that all fluids must be colorless or amber so that it would be acceptable to be used on streets in the US. Well, except for the DOT 5 silicone which must be purple in color. It is very true that most of the time, the brake fluids are the ones which are neglected most by the drivers. Mostly drivers would check the tire performance or tire pressure. Changing their engine oil in frequent intervals would also be on top of their list. Probably, no one would ever dare change the brake fluid in their street cars. Brake fluid is used to provide an incompressible medium in order to transmit the pressure of the driver’s foot on the brake pedal. This is through the master cylinders to the calipers so that it would clamp the friction material against the discs. The foot pressure is then multiplied by the mechanical pedal ratio and also the hydraulic ratio of the master cylinders, booster and also the caliper piston. This is just a very simple concept. When your brakes are fresh, your driving would be smooth and convenient. However, there are some problems you may encounter in the proper functioning of brake fluids. When the brake fluid is overheated, it will definitely boil in the caliper. It will then produce gas bubbles. And then it will eventually lead to a soft brake pedal. It would then be very hard for you to pump your pedal once it happens. We will then discuss the boiling points. There are two classifications of brake fluids. One is the dry boiling point. And the other one is the wet boiling point. They are also classified by the US Department of Transportation or what we know as DOT. They are classified as DOT 3, DOT 4, Dot 5, and DOT 5.1. The FMVSS 116 is what we call to the US Government specifications for brake fluids. The FMVSS 116 does not dictate the chemical composition of the said classification of brake fluids. It just defines the properties of the fluid. It defines the equilibrium reflux boiling points. The wet boiling point and the dry boiling point. The FMVSS 116 also defines the viscosity of the brake fluid. Viscosity is the property of fluids that causes them not to flow easily because of the friction of their molecules. It also defines the high temperature stability, the corrosion characteristics, as well as the effects of the fluid on seals, and also other physical properties like stratification, the tendency to form sludge or crystalline deposits. Stratification is the ability or the tendency to jell or separate. The brake fluid has to be compatible with hoses and rubber seals to allow the braking systems achieve long service and optimal performance. Most consumers tend to give high importance to the boiling point and the viscosity of the said fluid. Another thing that also deserves attention is the container of the fluid. Silicone based brake fluid naturally absorbs water from the humidity in the air. The container and brake reservoir functions as a barrier to the moisture in the air reaching the brake fluid. If you buy a brake fluid, make sure that the container is thick enough to provide a long life to the fluid once used. Here are some of the best brake fluids you’ll find in Amazon. Find out their qualities and features that will make you amazed. 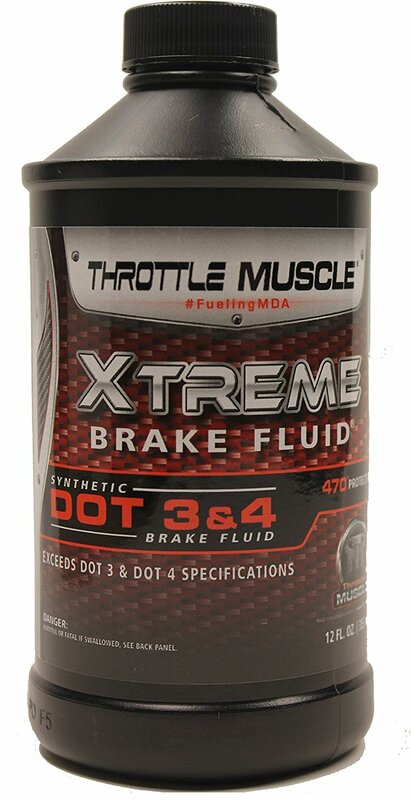 The Throttle Muscle Xtreme Brake Fluid is a number one selling brake fluid. It comes in a 12 oz. bottle. This is a synthetic brake fluid that exceeds the requirements for both DOT 3 and DOT 4 brake fluids. This special formulation offers 470 degrees of total protection. The Xtreme Brake Fluid is generally formulated to guard against vapor lock and moisture absorption. This is also excellent for complete flushing and topping off of brake systems. The Xtreme Brake Fluid is very compatible with all brake system rubber components and other like fluids. It is also specially designed to be used in disc, drum and ABS brake systems. It helps prevent seal hardening or seal softening. And what makes this the best is that this brake fluid surpasses the specifications of the SAE J1703 and FMVSS No. 116. So this Xtreme Brake Fluid from Throttle Muscle works best for you. The AS401 DOT 3 Synthetic Brake Fluid is beautifully manufactured by Prestone. This Prestone Synthetic Hi-Temp Brake Fluid is specially designed to provide an extra margin of safety in extreme braking conditions. It also provide an extra margin of boiling point protection. And is especially designed for safe operation of today’s modern brake systems as well. The comprehensive inhibitor package is made to protect vital brake system metals. This brake fluid is a mix of polyglycol ethers that will not create dangerous vapor because it ensures hot brake system operation. This fluid avoids a spongy pedal and delivers a braking power when needed. This Prestone Synthetic Hi-Temp Brake Fluid is best for ABS, disc and drum brake systems. The minimum dry boiling point is 460 degrees Fahrenheit or when converted to degree Celsius, it would be 238 degrees Celsius. While the minimum wet boiling point is 284 degrees Fahrenheit or 140 degrees Celsius. Both wet and dry boiling points of this brake fluid exceeds the minimum government standards of Federal Motor Vehicle Safety Standard No. 116 and the SAE J1703. 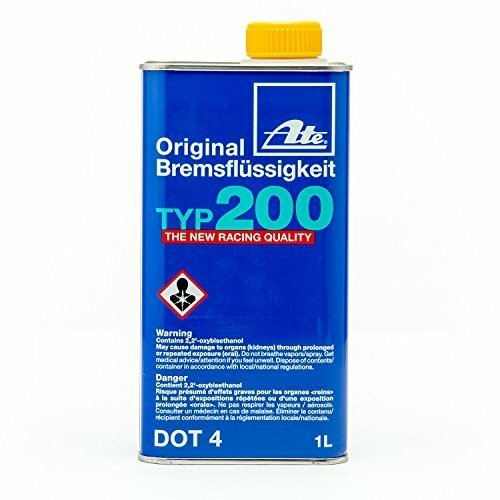 The ATE Original TYP 200 DOT 4 Brake Fluid is created with high performance formula. It has an outstanding water binding properties that is why it has a minimal drop in boiling points. It has a minimum dry boiling point of 536 degrees Fahrenheit and a minimum wet boiling point of 374 degrees Fahrenheit. The ATE Original TYP 200 DOT 4 Brake Fluid meets the specifications and standards of the SAE J1703 and FMVSS No. 116 DOT 4 standards. It comes in 1 liter. 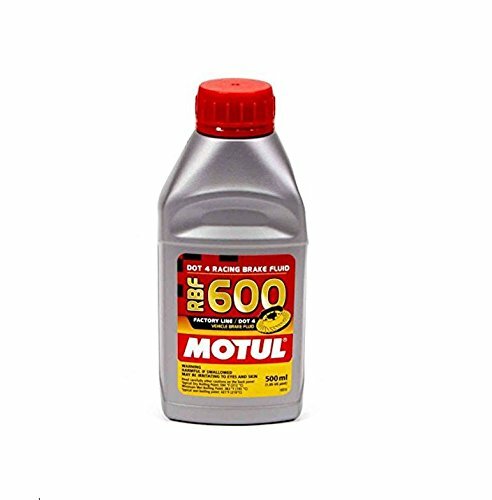 The 8068HL RBF 600 Factory Line DOT 4 Brake Fluid is a non-silicone brake fluid. That is why this is best used for hydraulic actuated brake and clutch systems which require a non-silicone synthetic fluid. It is manufactured and designed especially to resist high temperature of racing actuated brake, whether steel or carbon, and also clutch systems. This brake fluid exceed the standards of both DOT 5.1 and DOT 3. Well, except for the viscosity at -40 degree centigrade or -40 degree Fahrenheit. It has a very high boiling point of 312 degree centigrade or 594 degree Fahrenheit, which is why this brake fluid is specially designed with extreme thermal resistance and stability. Hence, this 8068HL RBF 600 Factory Line DOT 4 Brake Fluid is superior to conventional DOT 5.1 non-silicone base or DOT 5 silicone based fluids, and DOT 4. The conventional DOT 5 silicone based fluids has a boiling point of 260 degree centigrade or 500 degree Fahrenheit mini. The conventional DOT 4 has a boiling point of 230 degree centigrade or 446 degree Fahrenheit mini. 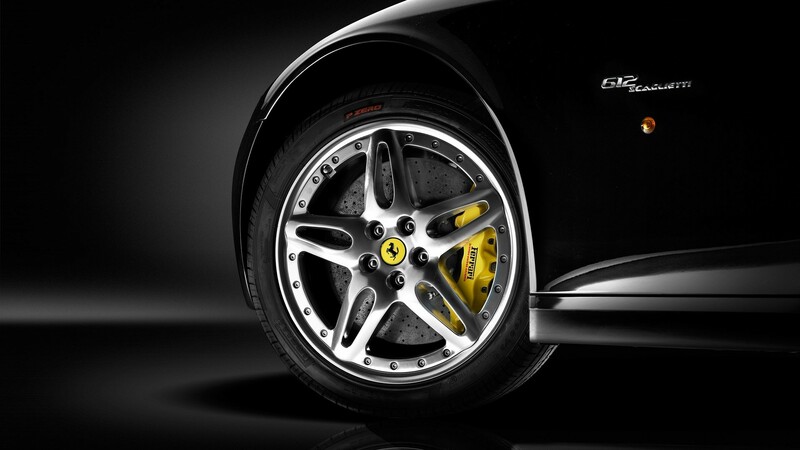 The extreme thermal resistance and stability enables an effective brake even under extreme conditions. It is very efficient when rainy days where the very high wet boiling point is 205 degree centigrade or 401 degree Fahrenheit, which is superior to conventional DOT 5.1 and conventional DOT 4. Conventional DOT 5.1 has a very high wet boiling point of 180 degree centigrade or 356 degree Fahrenheit mini and is silicone based fluid. The conventional DOT 4 has a very high wet boiling point of 155 degree centigrade or 311 degree Fahrenheit mini. The conventional DOT 3, DOT 4, and DOT 5.1 rake fluids have the tendency to absorb humidity in the air. Which is why their boiling points reduces and their risk to get to vapor lock phenomena increases. How to measure wet boiling point? The wet boiling point is measured by humidifying the product with about 3.5 per centum of water. This product comes in 500 ml. The Pentosin 1204116 Super Dot 4 Brake Fluid manufactured with superior quality to be used universally in modern brake systems. This brake fluid is ideal and best for vehicles with ABS systems. 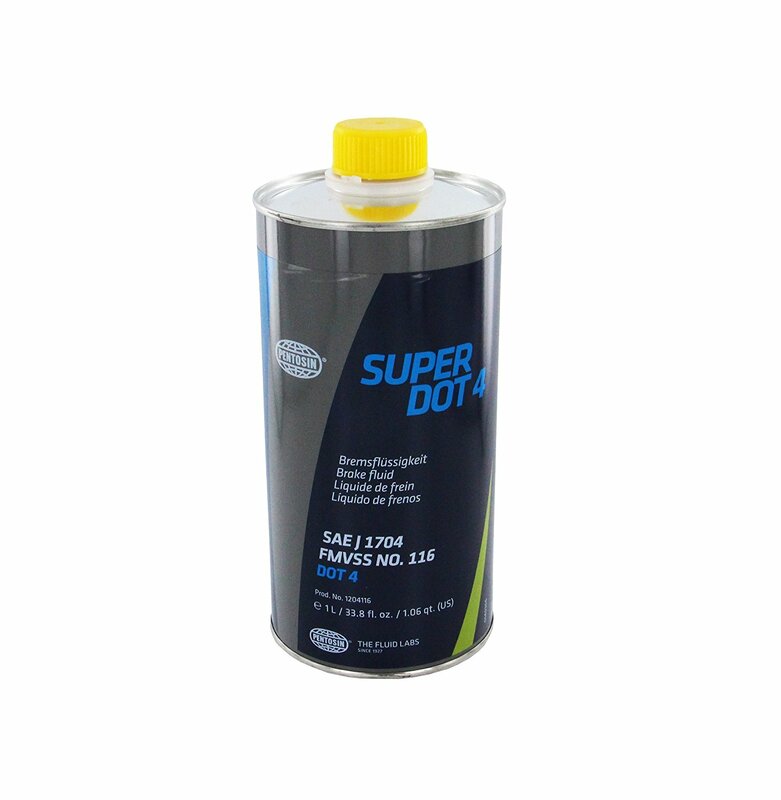 This Super DOT 4 Brake Fluid has an excellent resistance in absorbing water and retaining water.it provides superior corrosion resistance and it offers safety and total protection against vapor lock phenomena. This product comes in 1 liter. 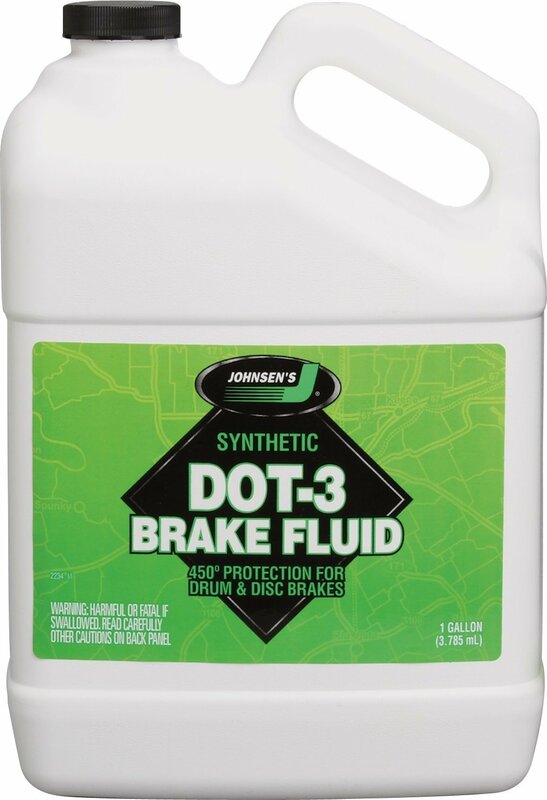 The 2234 Premium DOT 3 Brake Fluid comes in 1 gallon and is beautifully manufactured by Johnsen. 2234 Premium DOT 3 Brake Fluid is designed to provide an extra margin of boiling point protection. This ensures hot brake-system operation and will not create dangerous vapor. This delivers braking power when needed by avoiding a spongy pedal. Both wet and dry boiling points exceed the minimum government standards. A comprehensive inhibitor package protects vital brake system metals. Johnsen brand premium Brake Fluid is designed for safe operation of today’s modern brake systems. Excellent for ABS, disc and drum brake systems. Complies with Federal Motor Vehicle Safety Standard 116. Meets SAE J1703. 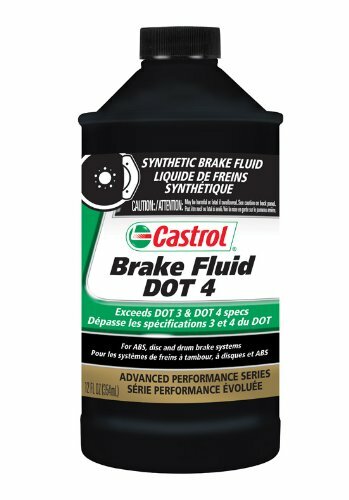 This Castrol 12509 12 PK DOT 4 Brake Fluid is a brake fluid generally recommended for complete fluid replacement and top off mostly in cars and light trucks. It is designed with a unique low moisture activity formulation that provides maximum wet boiling point total protection. This brake fluid is also recommended for all anti-lock braking systems, hydraulic drum, and as well as disc braking systems and hydraulic clutches which requires DOT 3 and DOT 4 fluid. What’s best about this brake fluid is that this brake fluid exceeds the DOT 3 and DOT 4 and all leading auto manufacturers’ requirements. This product comes in 12 oz. and is packed in 12. So hurry! Purchase one now. 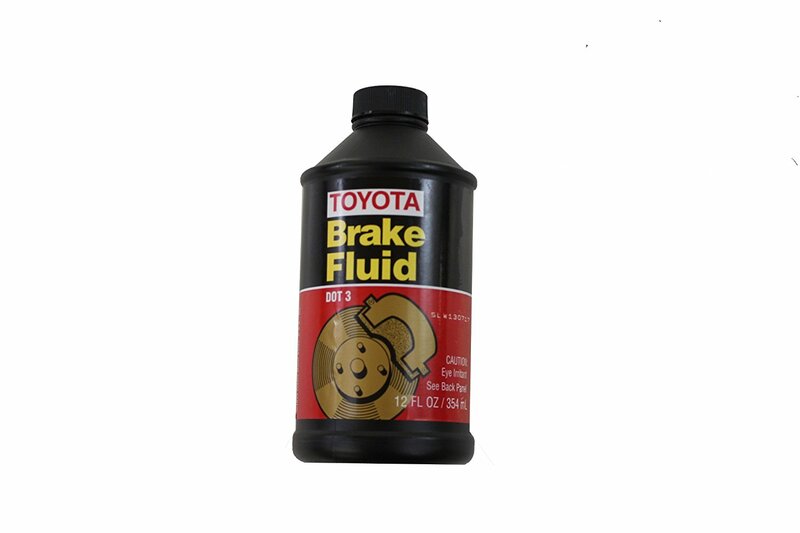 The genuine Toyota 00475 1BF03 Brake Fluid is developed and specially designed for brake and hydraulic clutch systems to reduce vapor lock. How? By providing a higher boiling point. This is the exact original equipment manufacturer fluid that your vehicles may need. This brake fluid maintains its high boiling point even under the most severe operating conditions. It is designed with a superior metal component that provides total protection against metal corrosion and does not form harmful sedimentation. It also helps prevent leakage. This is best used in the master brake cylinder. And the genuine Toyota 00475 1BF03 Brake Fluid meets and even exceeds the standards of the FMVSS No. 116 and SAE J1703. It also exceeds the DOT 3 performance specifications. This brake fluid comes in 12 oz. You can be assured that this Toyota product is as durable as your Toyota vehicle. Products from Toyota are crafted to the same high standard as your vehicle of the same manufacturer. Be relaxed and assured that these are developed through the performance and durability testing of professional community. 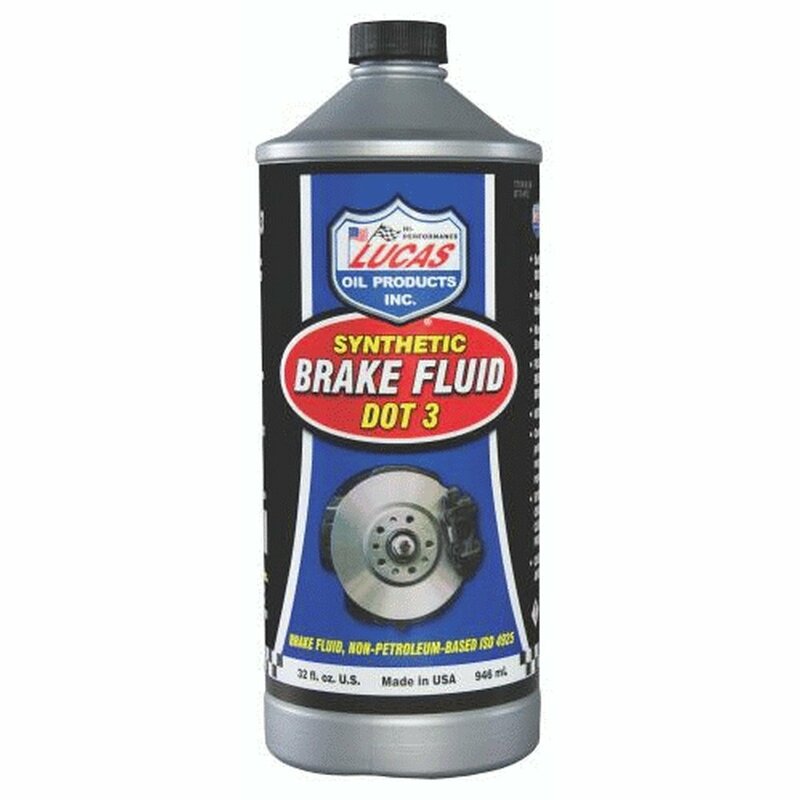 The Lucas Oil 10826 Brake Fluid is created with a high quality blend of polyethylene glycol ethers and additives. That is why this brake fluid exceeds the industry minimum dry boiling point of 401. This brake fluid also meets the specifications and standards of the Federal Motor Vehicle Safety Standards or the FMVSS No. 116 and SAE J1703 specifications. This Lucas Oil 10826 Brake Fluid is recommended to be used in both disc and drum brake system and also in clutch system. Systems and discs where this type of fluid is basically needed. This brake fluid prevents seal hardening and seal softening. This is very compatible with all brake system rubber components and other brake fluids. It provides excellent lubricity and is designed to protect against corrosion and rust. The Lucas Oil 10826 Brake Fluid comes in both 12 oz. and 32 oz. bottles. The Wagner DOT 5.1 Severe duty Brake Fluid is designed to maintain proper movement for safe and effective stopping performance. It reduces noise and helps deliver a quieter braking system making your driving smooth and convenient and comfortable. It also produces smoother pedal travel. It promotes longer brake life and effective, high quality performance. This DOT 5.1 Severe Duty Brake Fluid is creatively manufactured by Wagner. Wagner deliver improved OE designed products to the stores including the brake hydraulics. This gives you the capability to repair and improve a brake system with Wagner’s finest products available in markets. The brake hydraulics are best for foreign, domestic, passenger car, SUVs, vans, and even light trucks. You are assured that Wagner products are very durable at low costs. So purchase one now and see the amazing changes you exactly need.